And Moto Guzzi invented the swing-arm. Moto Guzzi has a venerable history of technological firsts. Many of the components now used on the majority of today's motorcycles were introduced for the first time in the historic Guzzi factory on the Lariano mountains. This was the case, for example, with the rear suspension with swing-arm - also the origin of a legendary motorcycle raid in which Giuseppe Guzzi, the founder's brother and production engineer, played a leading role. In 1928, long-distance excursions were hampered by a serious technical flaw - the lack of rear suspension. The alternatives used until then were not able to maintain the frame under correct torsional rigidity and what was gained in comfort was lost in lack of handling. The inventiveness of the Guzzi brothers created an elastic frame with a sheet steel box enclosing four springs, together with a swing-arm in tubes and sheet metal which they then used on the G.T. It was also the embryo of the first modern rear suspension and the basis for the first genuine Gran Turismo motorcycle. Original in everything, the Guzzi Brothers chose a highly particular test - a 4,000 mile journey from Mandello del Lario to Lapland in northern Norway, inside the Arctic Circle. A monumental enterprise, considering the disastrous condition of European roads at that time. But in four weeks, Giuseppe reached his destination. The elastic frame with rear suspension was so successful that it was introduced in production machines and the G.T. was named "Norge" in memory of that unprecedented feat. This is why Moto Guzzi decided to name the first "Gran Turismo" of the new era the "Norge". It is immediately obvious that it has been designed to eat up the miles. From the front fairing, for example, which rises up from the profile of the motorcycle as if it were a natural extension. But everything on the Norge 1200 is in the name of total protection. The front fairing is integral and includes leg guarDual Sport at the front and mudguarDual Sport at the back to cope with any form of weather without problem. As well as deflecting turbulence away from the rider's chest, the winDual Sporthield can be adjusted electrically to adapt to the various riding conditions. The powerful front light assembly with its four polyelipsoidal headlights provides a clear view even on poorly lit roaDual Sport and adDual Sport to the charisma of the front of the motorcycle, giving it an aggressive feline look and a design which once again emphasizes the combination of form and function. Available as an accessory the Tom Tom “Rider” GPS navigation system has been perfectly integrated into the cockpit, offering a Bluetooth wireless connection in addition to satellite navigation; the calls are automatically relayed from the cell phone to the earpiece inside the helmet, allowing the rider to stay in contact with the rest of the world in complete safety. The dedicated panniers, in the same colors as the body and with single lock, do not affect the total dimensions of the motorcycle or project beyond the rear view mirrors. Small details which are signs of the close attention paid to every aspect of the design, transforming even the simplest trip into a comfortable and safe journey. In genuine Gran Turismo style. Norge 1200. 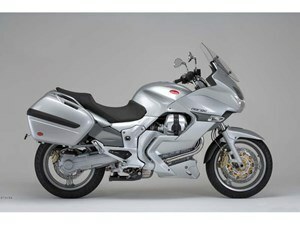 Moto Guzzi starts again from the top - of the world. The Gran Turismo for the 21st century is born… at Mandello del Lario of course. A tribute to its predecessor and not just in name - the concept of ABSolute protection and comfort has simply been translated into modern day language and technologically updated. The Norge 1200 has an elegant and dynamic design, excellent ergonomics and comfort and short wheelbase to make it competitive even in the traffic. Dynamic and responsive, the Norge 1200 is a modern Gran Turismo which makes flexibility its main strong point as it crosses city centres and boundless distances with the same ease. Its generous and tireless heart is a new version of the 90° V-twin, in a 1200cc version improved to obtain higher torque. So maximum pleasure on mountain passes and complete safety when overtaking on the motorway. The mechanics go hand in hand with the engine, with a steel frame and a suspension system which guarantees maximum comfort, even when carrying a passenger and luggage, thanks to the numerous possibilities for adjustment. The Norge 1200 does not shy away from even the roughest roaDual Sport, as it is fitted as standard with ABS which can be deactivated as desired. In the seat of a bike like this, the North Pole is really not that far away! Wheels: 3-spoke light alloy, gravity castingFront: 3.5 x 17 in.Rear: 5.5 x 17 in. Front: 120 / 70 ZR17 in.Rear: 180 / 55 ZR17 in.